Tris(1-phenylisoquinoline)iridium(III), Ir(piq)3 is a deep red phosphorescent dopant material. Due to their high electron affinities, quinoline/isoquinoline-based compounds have received considerable attention in optoelectronic materials. With greater π-electronic conjugation in the isoquinoline ring, the energy of the lowest unoccupied molecular orbital (LUMO) is significantly lowered, and the energy gap is reduced. 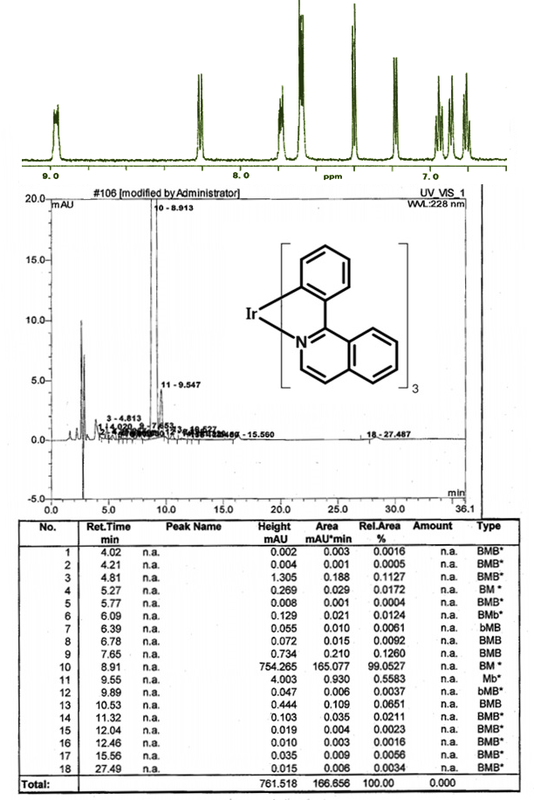 Ir(piq)3, together with Ir(piq)2acac, are the ones that have been most studied in theisoquinoline iridium complex family. The 'piq' unit of the ligand part can partially suppress the triplet-triplet annihilation and show short phosphorescent lifetimes. *For chemical structure information, please refer to the cited references. Efficient simple structure red phosphorescent organic light emitting devices with narrow band-gap fluorescent host, T. J. Park et al., Appl. Phys. Lett., 92, 113308 (2008); doi: 10.1063/1.2896641. Homoleptic Cyclometalated Iridium Complexes with Highly Efficient Red Phosphorescence and Application to Organic Light-Emitting Diode, A. Tsuboyama et al., J. Am. Chem. Soc., 125, 12971-12979 (2003). DOI: 10.1021/ja034732d. White-Light-Emitting Diodes Based on Iridium Complexes via Efficient Energy Transfer from a Conjugated Polymer, T-H. Kim et al., Adv. Funct. Mater., 16, 611–617 (2006). DOI: 10.1002/adfm.200500621. Efficient multiple triplet quantum well structures in organic light-emitting devices, T. J. Park et al., Appl. Phys. Lett., 95, 103303 (2009); doi: 10.1063/1.3224190. Color stable white phosphorescent organic light emitting diodes with red emissive electron transport layer, J. W. Kim et al., Appl. Phys. Lett., 117, 245503 (2015); doi: 10.1063/1.4923048. Highly Efficient Simple-Structure Red Phosphorescent OLEDs with an Extremely Low Doping Technology, W. S. Jeon et al., J. Info. Display, 10 (2), 87-91, (2009). Very-High Color Rendering Index Hybrid White Organic Light-Emitting Diodes with Double Emitting Nanolayers, B. Liu et al., Nano-Micro Lett., 6(4):335–339 (2014); DOI 10.1007/s40820-014-0006-4. Study of Sequential Dexter Energy Transfer in High Efficient Phosphorescent White Organic Light-Emitting Diodes with Single Emissive Layer, J. Kim et al., Sci Rep., 4: 7009 (2014); doi: 10.1038/srep07009. A white organic light-emitting diode with ultra-high color rendering index, high efficiency, and extremely low efficiency roll-off, N. Sun et al., Appl. Phys. Lett. 105, 013303 (2014); http://dx.doi.org/10.1063/1.4890217.